Home » Is the Cloud Ready for Your Voice? You Decide. According to industry guidance, 20% of businesses will be shifting on-prem PBX to a hybrid model in the next 3 years! This is a effectively a revolution in an area of IT known for stability, not upheaval. What does it mean for you? Why are organizations making this shift? How would your organization benefit? What are low-risk ways my organization can participate? Who can help me evaluate my options? How do you justify the investment? Conferencing is a tool for all knowledge workers. Information workers top to bottom no longer have all the answers to today’s business c hallenges. Workers must be experts at assembly of information from organizational insights, internal/external sources, and people. The communication tools must be pervasive, powerful, and delightfully easy. Does your organization have this today? Enhance don’t lift and shift. If voice services have been anything, historically they have been reliable. An organization’s best move is to supplement and enhance voice services (hybrid) with desired capabilities like mobility, presence, and screen sharing. Microsoft is well-positioned. 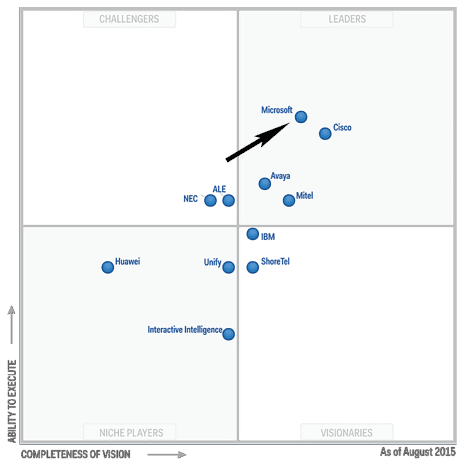 Betting your organization’s communication strategy on Microsoft has good odds according to industry analysts. SG&A down, revenue up. Achieving both is the objective. Let our Advisory Services team help you evaluate your situation. Below the line reductions are good – The cost of travel is expensive. According to industry guidance, the average travel expenditure per employee is $2,250. If conferencing was easy and widely available, a 2% reduction in travel is achievable. Above the line increases are better – What quantifiable improvements can we measure and achieve? The table below has guidance for some that we’ve experienced. Is the cloud ready for your organization’s voice and conferencing needs? Drop us a line. We’d be happy to help you figure out if and how it fits into your strategy. Email us at info@peters.com.